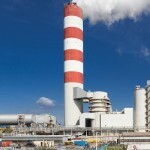 Large coal-fired power station increases its efficiency by eliminating flue gas reheat and converting its chimney to a PennguardTM borosilicate glass block lined wet stack. Essent, a member of the German utility group RWE, is one of the Netherlands’ leading electricity producers. Essent’s Amercentrale 8 and 9 power stations in the southwest of the Netherlands are among the largest coal-firing plants in the country. Commissioned in 1994, Amercentrale 9 has a 640 MW supercritical coal-fired boiler and it produces a further 350 MW of district heating. In recent years it has co-fired biomass, and this now accounts for 35% of the total fuel input. Amercentrale 9 has used a flue gas desulphurization (FGD) system from the outset, and this included a steam reheater downstream of the FGD system, which increased the temperature of the flue gas going into the chimney from around 45°C to around 60°C. In 1997, three years into operation, acidic puddles were found on concrete supports in the lower third of the chimney – evidence of leakage through the brick. Fortunately this was spotted quickly, and a solution delivered: a PennguardTM borosilicate glass block lining was installed up to a height of 75 m, covering 1,500 m² or 40% of the internal surface to prevent any further leakage. After some 20 years of operation, the steam reheater of Amercentrale 9 had come to the end of its useful life. Essent then considered the options of replacing the reheater, or converting the chimney to a ‘wet stack’, carrying 45°C, water saturated flue gas. It was important to consider not only the initial investment needed for this, but also any impact on running costs. An in-depth study by Essent and its parent company RWE Group found that there was little difference in the necessary capital investment between the two options. 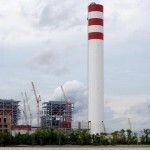 However, converting to a wet stack had a notable advantage: not operating a reheater would deliver a significant increase of overall power station efficiency. 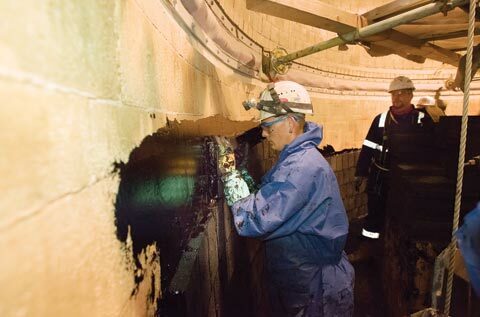 It was also found that lining the remaining 2,518 m² of brick flue with PennguardTM was achievable within an already scheduled 31-day outage. 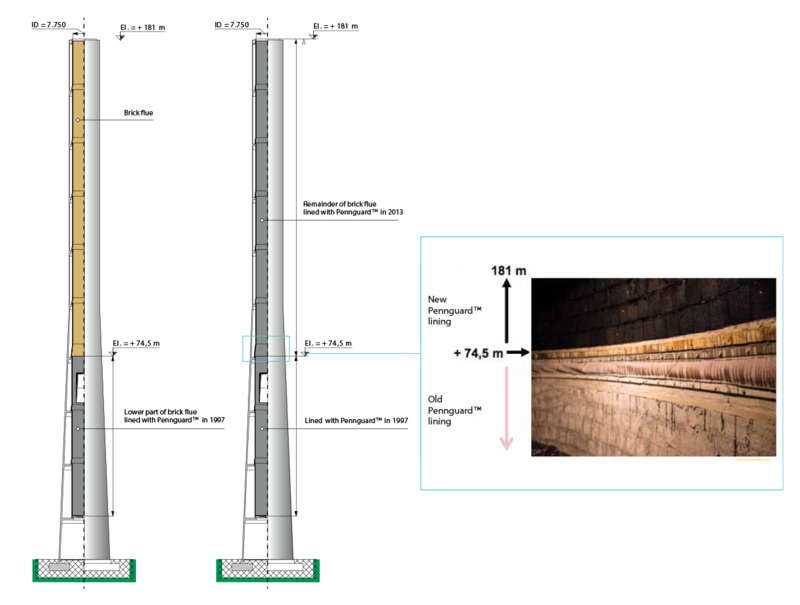 The decision to convert the Amercentrale 9 chimney to wet stack operation through the use of PennguardTM borosilicate glass block linings had one important condition: that the lining installation on the remaining 2,518 m² could be achieved within a planned 31-day outage. Any additional outage would impact production, with significant financial implications that would render the conversion uneconomical. Having considered proposals from several chimney specialists, Essent appointed German chimney builder Züblin Chimney and Refractory GmbH (Züblin) as their contractor. To ensure it could complete the installation safely within the scheduled outage, Züblin scheduled its crews to work around the clock in three eight-hour shifts. The speed and quality of a lining installation depends, in part, on having a stable, secure platform with enough room for: the installation crew, support workers, lining materials and tools. One absolute requirement for a good installation is a high-quality roof on top of the chimney, to shield the work from any rain and to enable the crew to regulate the air flow through the chimney. 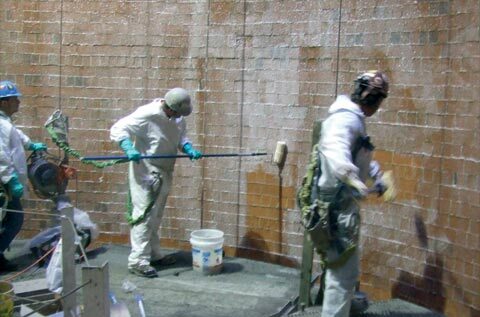 Before the installation work started, the entire brick surface was lightly grit blasted, cleaned and then coated with Penntrowel Epoxy Primer. This preparatory phase took 5 days. The PennguardTM lining was installed by teams of 9 bricklayers, each with 2 support workers, operating in continuous eight-hour shifts. When transitioning from one eight-hour shift to the next, each installer would continue his work on the platform and hand over his tools immediately to his replacement. This phase of the work took 12 days. Züblin completed the PennguardTM installation ahead of schedule – 24 hours in advance of the end of the planned outage. Converting a chimney to wet stack operation demands quick work within scheduled outages. With PennguardTM linings, it’s possible to line a chimney in phases, dividing the work over multiple scheduled outages. With most other chimney modification methods, this is impossible. The Amercentrale 9 chimney offers an excellent example of a phased PennguardTM installation, and illustrates the uniquely flexible nature of the PennguardTM borosilicate glass block lining technology. This lining technology does not require any structural modifications to the chimney or its internal flues. While the installation can, in many cases, be achieved within a single outage, it can also be completed in phases. Even if market pressures demand the outage to be shortened and production to restart sooner than planned, the PennguardTM lining can be left partially completed with no adverse effects on the lining installed so far. The installation can then be completed at the next scheduled outage – or even much later.